The mark of a good movie is if you are still thinking about it and its characters the day after you see it. While I was still thinking about the two leads in Like Crazy the day after I saw it, it was a very slow-moving film and could have been better. Jacob (Anton Yelchin, Fright Night) meets Anna (Felicity Jones, The Diary of Anne Frank) while they are in college together in Los Angeles. 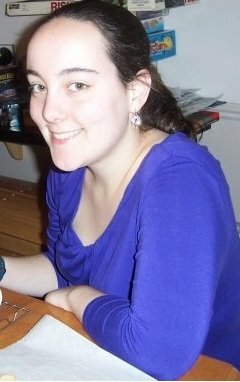 Anna is British, and she in the U.S. on a student visa, which will expire soon after she graduates. Anna is intrigued by Jacob and leaves a note under the windshield wiper of his car expressing her feelings for him; soon after that, they become a couple. Jacob is a gifted furniture maker, and he gives Anna a chair that he makes for her, to replace the rickety desk chair that she was using. By the end of the school year, they are very much in love; however, it will soon be time for Anna to return back to England. She will be able to procure a work visa after a few months, so then she will be allowed back into the U.S., so they would only be apart a few months. Instead, though, Anna decides to ignore the terms of her visa and stay in LA for the summer with Jacob. Anna has to leave to attend a wedding in England at the end of the summer, and when she tried to get back into the U.S. she is denied entrance, since she abused her student visa. She and Jacob talk on the phone, and they discuss him coming to visit her in England, but for the time being she is not allowed back into the U.S. When Jacob does visit her in England, Anna's father offhandedly suggests that things would be easier for the two of them if they were married - ie, it would be easier for Anna to overcome the visa problems - which freaks Jacob out a little, but they do eventually get married in England. Jacob returns to the U.S. shortly after and over time, more and more distance comes between them. When Anna finally does get her visa problems worked out, their relationship is not the same as it used to be, though they are still married. Maybe see this movie. There were a lot of things I liked about this film and a lot that I did not. The pacing is too slow, even though the director chooses to show us only bits and pieces of their relationship - I admit that I was definitely checking my watch a few times throughout it, even though it's only 90 minutes long. One of the best things about the movie, though, is that you really want to root for Jacob and Anna to be in the same place; they are cute together, and their heartache at being apart from each another is palpable. Even though they do get a "stolen summer" together, I don't think Anna should have abused the terms of her visa; if she had gone home to England when she was supposed to, she probably would have been able to get a work visa and return to the U.S. quickly, and instead, it takes years for the ban on her visa to be overturned. In addition, there are little moments sprinkled throughout the film that, if you notice them, add a lot to the movie. A boyfriend of Anna's buys her a new chair, and she awkwardly asks him what he did with her old one (the one Jacob made for her); you can see that she is fearful that he threw it out or donated it. Another time, Jacob calls his assistant and girlfriend Sam (an underused Jennifer Lawrence) "Anna" by accident, and she throws him a look, since she knows who Anna is and what she means to Jacob. The ending of the film, too, reminded me a little bit of Blue Valentine, and although it was an appropriate ending, it was definitely heartbreaking too. 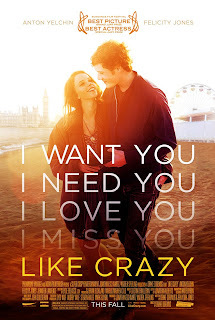 I recommend seeing Like Crazy if you have ever had a long-distance relationship and/or you can stand the slow pacing; the story is definitely an interesting one, and will have you thinking about the characters long after you leave the theater. Like Crazy is in theaters today, November 11th, and is rated PG-13 with a runtime of 90 minutes.